If you want your car sound system to perform better, you might want to consider getting a subwoofer. 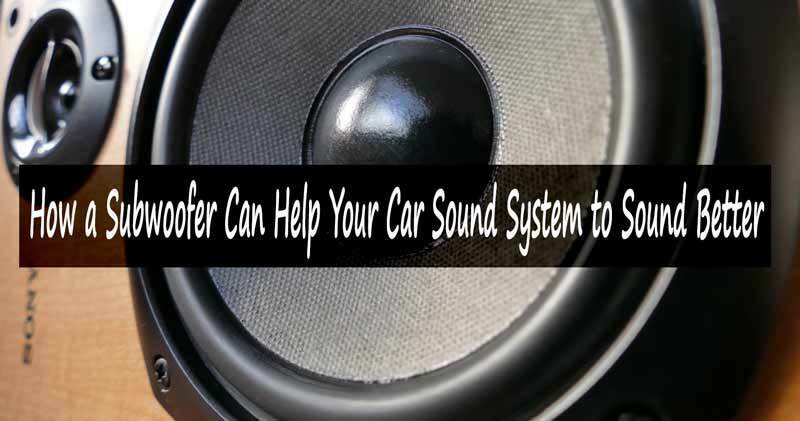 This will help your car sound system to sound better because subwoofers form a key element in any stereo system. Therefore, in order to achieve the best possible sound in your car, you might need to get rid of all the stereotypes about subwoofers. It is important that one gets to understand what subwoofers are and how they can help your car sound system to sound and perform better. Subwoofers are the best in producing low-frequency audio sounds. Installing subwoofer speakers in your car will improve the quality of the sound produced in a significant way. This is because subwoofers are mainly designed to produce low-frequency sounds that make any kind of music genre to sound better. This does not just apply to the bass heavy music types. If you have a variety of sound frequency in your car sound system, your music gets to sound real and deep. In most cars, the speakers are mainly mid-range and are found in the door panels. These car speakers are normally too small to be able to give sound with low frequency. This is therefore the ultimate reason why you should consider adding a subwoofer to your car sound system. It will guarantee you a better sound hence significantly help your car sound system to sound better. Subwoofers help to produce lower frequency sounds therefore they help lift this burden off the smaller speakers in your car. The small speakers, also known as tweeters, will then primarily focus on producing sounds with higher frequency. This is what they were originally designed to produce. If you force the high and mid-range small speakers in your car to produce low-frequency sounds, it will cause distortion. Distortion of sound occurs when a speaker’s cone is intensely vibrated beyond its sound capacity. Subwoofers are a must-have in any car sound system because they can help your car stereo system to last longer. When you continuously depend on the small car speakers to produce low bass tones, this might strain the speakers and result in sound that is not of good quality. This might eventually cause the car speakers to be permanently damaged. Subwoofers will help to increase the lifespan of your car speakers by allowing the deeper cone variations that are needed in producing low-frequency sounds. This lifts the burden on the mid-range small car speakers and generally helps them last longer. In case you are worried about the limited space in your car, you need not be worried at all. This is because subwoofers can typically be placed anywhere in your car. They are a bit bigger than the ordinary car speakers but they can fit anywhere. You can have them in your car trunk and still be able to experience their bass tones quite clearly because the tones are non-directional. It is scientifically proven that the human ear is likely not to determine where the low-frequencies are coming from. This is because, having a subwoofer in your car, it makes it seem like the bass sound is coming from all directions and produces the same impact as though the subwoofer is placed below your car seat. Therefore, a subwoofer will improve your car sound system and help it to sound better. Whether you love listening to rock, hip-hop or reggae in your car, installing subwoofers will greatly improve your listening experience. This is because subwoofers can make any kind of music sound better than when played on the ordinary speakers. It does not matter the genre of music, all types sound better when played through the low-frequency sounds produces by subwoofers. This is therefore going to help your car sound system to sound better. There are a few important factors that you need to consider before purchasing a good subwoofer for your car sound system. If you want to buy a good subwoofer, always pay attention to the RMS power ratings. They normally measure how much power output is required by the subwoofer in more realistic figures. Before making your purchase, ensure that the subwoofer’s power output matches your car speaker’s power output generally. The frequency range of the particular subwoofer you need to purchase will inform you how low the subwoofer can actually play. This will also depend on a number of factors, which include the type of box material that the subwoofer is mounted in. Therefore, depending on your music taste, it is important to consider the frequency range of a subwoofer before buying it for your car sound system. A subwoofer that is enclosed in a sealed box will give you much deeper sound and better bass tones. Therefore, you need to carefully consider the kind of enclosure in which the subwoofer is mounted, as this will have a profound effect on the kind of sound that it produces. It is always difficult to determine what size of a subwoofer plays the best bass sound. If you are looking for a subwoofer that will give you both loud and low tones and you have no issue with the space it will occupy in your car, then you might consider getting a big subwoofer. However, small subwoofers can equally serve the purpose when connected in the right power outputs and are properly enclosed. Consider the Impedance of the Subwoofer. You also need to pay close attention to the subwoofer’s impedance. Most of the speakers are rated at around 4 ohms impedance. Pick a subwoofer whose power rating and impedance will match with your amplifiers and car speakers power output. In a nutshell, good quality subwoofers will definitely improve your car sound system and help it to perform better. This is guaranteed because subwoofers will help your car speakers to sound better and increase their durability as well. They are flexible and can be placed anywhere in the car, most people place them in the car trunk. Consider the key factors before settling on a subwoofer that will last and improve your car sound sytem.